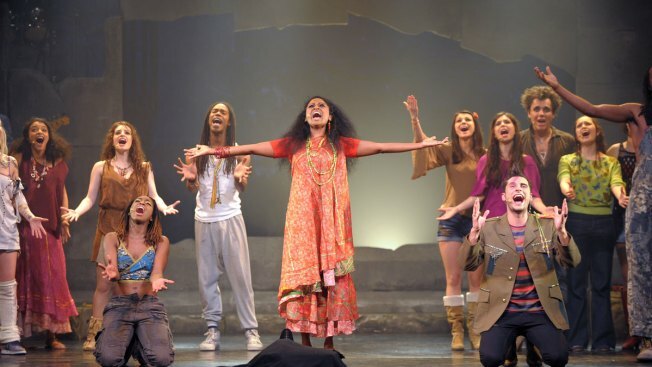 Artists perform on stage during the US rock musical "Hair" directed by French Sylvain Meyniac, at the Theatre du Gymnase in Paris, on March 18, 2011. NBC announced they are cancelling their live broadcast of "Hair Live! the musical." "Live musicals are a part of this network's DNA and we are committed to continuing that tradition with the right show at the right time," Paul Telegdy and George Cheeks, co-chairmen of NBC Entertainment, said in a statement. "Since these shows are such enormous undertakings, we need titles that have a wide appeal and we're in the process of acquiring the rights to a couple of new shows that we're really excited about." The hippie rock musical, Hair Live!, was set to air on NBC on May 19, but as Deadline points out, the musical would compete against two major television shows: HBO's series finale of "Game of Thrones" and the season finale of ABC's "American Idol." The publication also notes that Fox's "Rent," which starred Vanessa Hudgens, Tinashe, Kiersey Clemons and Mario (to name a few), didn't have the best ratings, which they think NBC was informed about. In fact, "Rent" brought in the lowest ratings ever for a live broadcast musical. NBC previously announced live versions of "A Few Good Men" and "Bye Bye Birdie," which was set to star Jennifer Lopez. However, production for "Bye Bye Birdie" has been delayed multiple times. Back in 2016, E! News reported that "Hairspray Live" had an initial audience of 8.9 million viewers and a 2.3 rating in the 18-49 demographic. However, the ratings were lower than "The Wiz Live" musical, which was also an NBC live musical. E! News has reached out to NBC for a statement.